I adore the bath and body products at Crater Lake Company, a small company owned by Sharonn Itliong in Peekskill, New York. I've long been a fan of Sharonn's products, especially her True Lustre Conditioner and her Silken Touch Dry Oil Perfume. You may remember me devoting an entire post to her Coconut Bavarois fragrance back in 2008. It's still a favorite. Sharonn recently asked me to try her newest scrub, the Zambian Coffee Body Scrub. I was eager to try this because coffee is great at giving less than taut and toned skin a firmer, tighter and more radiant glow. Who doesn't want that extra boost heading into the summer months? I received my scrub last week. I have used it 3 times now and I truly adore it. You know I can be critical when I am reviewing anything related to skin care. This is no exception. That said, there is nothing I do not like about this product. This is truly a multi-tasking product. It blends sugar with the coffee to provide the ultimate in gentle, yet effective exfoliation. It gets those pesky little flakes of dry skin with ease, while leaving the skin radiant and silky. Skin is left feeling feeling smooth and soft. I am very picky when it comes to scrubs. I tend to prefer an oily salt or traditional sugar and oil scrub that does not emulsify. Crater Lake Company's Zambian Coffee Body Scrub changed this for me. This is an emulsifying scrub I really adore! When I used it for the first time, I stepped into a warm shower and applied the scrub to my arms, legs, and torso. The scrub felt quite scrubby and then softened and nourished with the shea butter and natural oils. When I rubbed it in, it turned into pure, creamy luxury. The scrub felt rich and lovely on the skin and it rinsed clean without any kind of a residue. In the past, I've rinsed off emulsifying scrubs and while they tend to rinse clean, they leave my skin feeling parched. This is not the case with Crater Lake Company's newest scrub. After only one use, my skin felt much smoother and silkier. This is coming from someone who is religious about taking care of the skin. I can only imagine the immediate results for someone who skips exfoliation and regular moisturization. I have now used the scrub three times. Each time, I am more pleased with the product. It feels luxurious--much like a $100 scrub at the spa would only in the privacy of your own home. Did I mention the scent? I adore coffee. When you smell this, it is like opening a bag of fresh coffee beans. It's intense. One thing I was afraid of was the scent. If I use products with artificial coffee scented fragrance oils, they always turn on my skin. Not with this--real Zambian coffee is what I smell. The ingredients in the scrub also get my seal of approval. Since water could easily be introduced while using, a preservative is a must. This is paraben free and is gently and safely preserved with the same ingredients I used to put in my facial creams. Pure cane sugar, soybean oil, shea butter, and antioxidant vitamin E are also key ingredients. There aren't any nasties in this and that's very important to me. There's something else I would like to mention. Sharonn has always been involved in charitable efforts. She has been involved with the organization called Kiva and she is donating 20% of the profits from her coffee scrub to Camfed, The Campaign for Female Education. This organization helps fight poverty and HIV/AIDS in Zimbabwe, Zambia (where she grew up), Ghana, Malawi, and Tanazania. Their goal is to educate girls and empower women to become leaders of change. 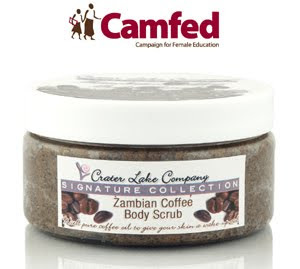 The Zambian Coffee Body Scrub sells on Sharonn's website for $19.95 for a large, 9 ounce jar. Your skin thank you for the caffeine boost, but the boost given to women in need through the sale of this great product will hopefully one day end the cycle of poverty and despair in Africa.